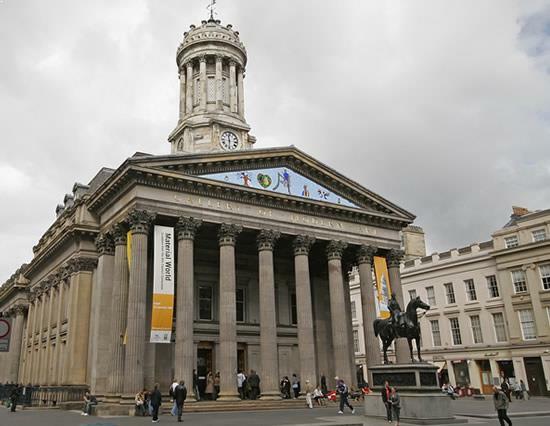 Located on the tasteful Royal Exchange Square, the Glasgow Gallery of modern art is the second most visited contemporary art gallery outside of London, attracting millions since its opening in 1996. Standing out amongst some of the city centre's more contemporary buildings, the widely acclaimed gallery is housed in a mix of both modern and neo-classical architecture. Built in 1778 originally as a townhouse for the city's wealthy tobacco lord William Cunninghame of Lainshaw, the building has been designated a number of uses over the years - once bought by the Royal Bank of Scotland in 1871 before becoming the Royal Exchange as the RBS moved on to Buchanan Street. Visitors are encouraged to stay for as long as the please to view the vast range of work, incorporating international artists such as Niki de Saint Phalle, David Hockney, Sebastiao Salgado and Andy Worhol to Scottish talent such as John Bellamy and Ken Currie. Among it's amenities, the gallery also provides a stylish café, guided tours, internet access, a library and accomodates disabled patrons. With a city centre location, the gallery is only 5 minutes walk from Buchanan St. or St. Enoch subway stations and also 5 minutes from Queen St. and Argyle St. train stations (10 minutes walk from Central Station). With such easy access and free admission the gallery is 'must-see' for any visitor to Glasgow, art enthusiast or other. The gallery also has a dedicated education and access studio, facilitating workshops and artists regularly hold talks for all age groups and levels of art enthusiasts. The gallery is renowned for it's statue of the Duke of Wellington on horse back at it's entrance. However, not so much for the statue itself rather the orange traffic cone rested upon the statue's head. Each time one is removed, another is placed, to the extent many have never seen the statue without it's mischievous addition. Authorities regularly removed the cone only for it to be replaced and have now to have given up, this is said to display the light-hearted nature of the city to the extent that when the city hosted the 2003 Champions league final (the biggest prize in world Club football) it was replaced by a hat bearing the name of the sponsor Amstel.